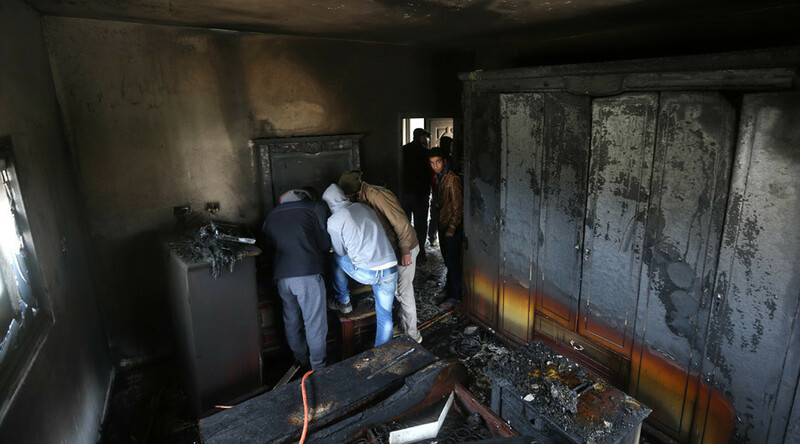 A fire struck the West Bank home of a key witness to last year’s arson attack by Jewish extremists that killed a Palestinian family, including a toddler. Locals said the house in the village of Duma, in the West Bank, only dozens of meters away from the murdered family’s home, was set on fire by unknown attackers on Saturday evening. They added that Molotov cocktails had been used to start the blaze, AFP reports. The owner of the house is Ibrahim Dawabsha, a relative of the family killed last year and a key witness in the case. He and his wife were in the building at the time the fire erupted, but both have survived, police and resident say. They have reportedly been transferred to a hospital in Nablus to receive medical treatment for smoke inhalation and were said to be in shock. Israeli police have launched an investigation into the incident. According to police officials, the cause of the fire is still unclear, and they have yet to determine whether it was arson. Meanwhile, the fact that one of the windows in the house had been shattered indicated that whatever caused the blaze came from the outside, just as in the previous tragedy, which was caused by firebombing. “The window was broken from the outside and flammable materials were found in the rubble,” a fire department head from the nearby city of Nablus, Col Malek Ali, told AFP. Last year’s attack saw unidentified Israeli assailants hurl a Molotov cocktail into the window of Saad Dawabsha’s home. The blaze that broke out killed an 18-month-old Ali Saad Dawabsheh and fatally wounded his parents. The couple’s older son, five-year-old Ahmed, was the only one who survived. The arsonists spray-painted Hebrew words “Long live the Messiah” and “Revenge” on the structure’s walls. Two people were charged in the case, following months of investigation, with Palestinians furious over its slow pace. Amiram Ben-Uliel, a 21-year-old from Jerusalem, was charged with murder while an unnamed minor was named an accessory. According to Ben-Uliel’s indictment, he decided to commit the arson in retaliation for the shooting dead of an Israeli by a Palestinian a month prior to the arson. Last year’s attack was condemned across the political spectrum of Israel, while the Israel Defense Forces, or IDF, which is responsible for security in the West Bank, described it as Jewish terrorism.